Firstly, it’s great to be back on the main blog. I have been away for the last week in North Devon taking a well deserved break after an intense period of work, which has meant that I have only been tweeting (@BristolNature) to keep things up-to-date. Hopefully things are slowing down now work-wise and I will be able to get back to sharing some more in-depth stories about the urban wildlife at Brandon Hill. Anyway, back to the blog..
Today has been the first day that I have managed to spend some proper time at Brandon Hill in what seems like an age. It has reminded me that you get out what you put in, as in just a few hours I saw recently fledged second broods of wrens and goldcrests, the returning sparrowhawks that I have been on the look-out for, tons of butterflies and my first Brandon Hill KINGFISHER!! I wouldn’t be surprised if it was the first ever record of a kingfisher at Brandon Hill Nature Park, as very unusual to see one in a small city-centre park, quite a distance from any substantial or suitable water bodies. Since my last proper post, working long days, has meant that I have only been able to make brief visits to the park during the day and my activities there have been mainly nocturnal, or at best crepuscular. The park after dark is a different place, and instead of birds and butterflies, I have been keeping company with bats and foxes. The fox-cubs are spending more time exploring and feeding by themselves, but are all looking a bit mangey and one has quite a limp. At least they’re not going hungry though, thanks to the rich-pickings left behind after picnics and barbecues. The whole of the main family of foxes are looking scruffy and mangey at the moment, but this has made it easier to tell from a distance when an unusual fox is in town and have noticed a healthy looking dog-fox hanging about on a few occasions. My main news though from the last few weeks is my discovery of the nocturnal and ultrasonic world of bats. I first saw them at Brandon Hill in mid-March, but being a complete novice combined with the fact that bats are tiny, move with great urgency and only come out in the dark, I have never been confident in identifying which species are here. My attempts at photography haven’t helped much either. Digital cameras are great for identifying things in the field, as even a quick snap of a butterfly or bird can often be studied closely to help identify it. Diurnal aerial creatures are more helpful than their nocturnal cousins though when employing this tactic, being often brightly coloured and highly patterned. 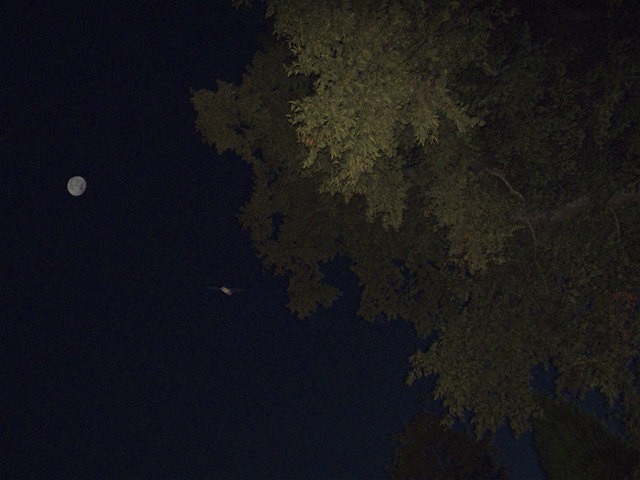 No matter how many times I have tried to do this with bats, I get the same brown blob – see below, just to the left of the darker tree-line. Not long after my night-shifts started, I began noticing a much larger bat than usual, flying with slower wing beats in a completely different pattern to the more common and smaller bats. It was mostly higher up in the larger trees and often out in the open, obviously after different insects. It’s quite exciting to discover something new, but very frustrating when you don’t know what it is, so I decided to try another technique and listen to it’s calls – as I might do to distinguish the difference between similar looking birds like willow warblers and chiffchaffs. 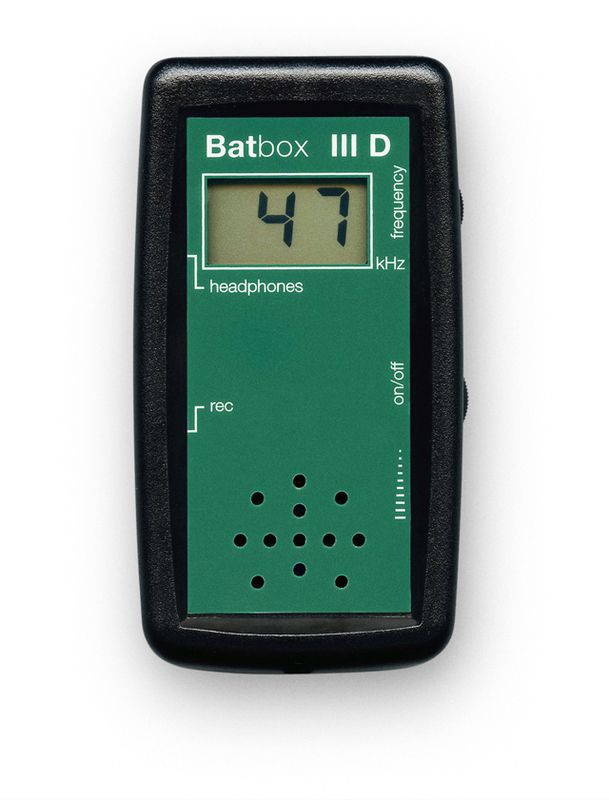 It turns out that bat species all use different frequencies to echolocate and communicate, and it is possible to use a basic heterodyne bat detector to tune in to the calls of a particular species, and deduce which species it is by the frequency it is calling at. After a brief bit of research (or googling), I went for a Batbox III D(above) and was away. It is surprising how intuitive using a bat detector is, and within minutes of turning it on for the first time, I could tell that the blob in the image above and the most common bats at Brandon Hill are common pipistrelles – and this is what they sound like when hunting for insects at around 47khz, recorded on my iPhone with a cheap adapter and cable (sound clips are flash based and might not display on all devices).. I tuned in to my “big bat” and listened to its off-beat jazz rhythm at at 28khz – typical of a serotine, which I have now seen on a few occasions and once located, can listen to without the detector as it is so loud. My third species of bat and most unusual is the leisler’s bat, which flies even higher in the treetops and is even louder and lower in frequency than the serotine (although wingbeats seem a bit faster), calling at around 24khz. I’m not 100% on this one, as it is quite uncommon, but it sounds very different from the serotine and I know there are leisler’s up in Clifton Village, so it’s not unthinkable that they would be coming down the hill to feed in the park around the mature trees and over the meadow. Have contacted the Avon Bat Group for confirmation and awaiting their reply. The leisler’s and serotines are some of the largest bats in the UK, apart from noctules and would be interesting to find out if they are roosting here in mature trees or perhaps on the tower. Highlights have been watching masses of gulls riding thermals and feeding on the flying ants that have been coming out on muggy days over central Bristol, the gorge peregrines chasing flocks of pigeons over Southville and Bedminster and red admirals taking up territories on lime trees and chasing off holly blues, speckled woods, large whites and even lime bracts and seeds as they fall from the branches above. A few bits of annoying news – the kids that have been making fires in the south-west corner, which was planted as a butterfly garden have now decided to chop all of the heads off the teasel and thistle, after ripping out most of the buddleia. Immediately bad news for the butterflies who would be feeding on the nectar or laying eggs and bad news for the birds in the long-term as the teasel would have gone to seed and provided them with food later in the year. They probably don’t know what they’re doing and how it might effect the wildlife, but is a shame nonetheless. Last bit of news is that the scaffold around Cabot Tower is coming down very quickly all of a sudden. The contractors have been working late with a never-before-seen sense of urgency and it looks like only a matter of weeks before it might be open to the public. Might be wishful thinking, but fingers crossed as things will be starting to move any day and would like to get up there before the Autumn migration starts proper. This entry was posted in Audio, Bats, Birds, Birds of prey, Butterflies & moths, Foxes, Nesting, Passerines, Photography, Video. Bookmark the permalink.